Click Here To See Cover With Logo Lifted Up. Click Here To See Amazing Spider-Man #160 Comic Book! 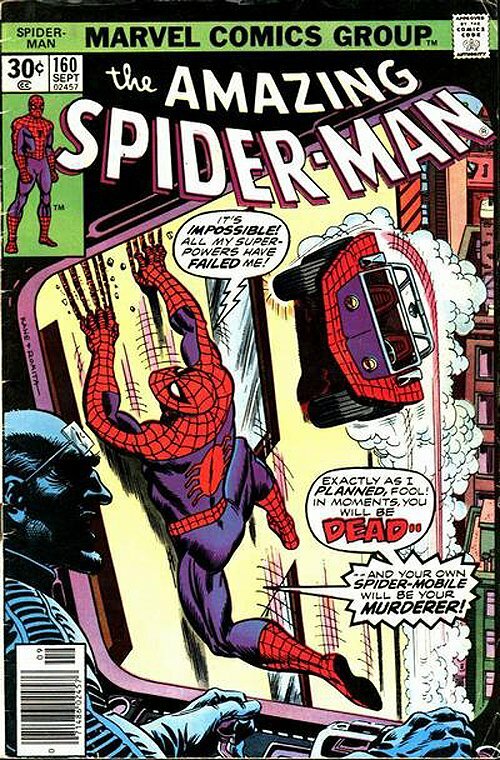 Check out this stunning 1976 Amazing Spider-Man cover which was penciled by the great Gil Kane, and inked by the great John Romita, from the story titled: "My Killer, The Car!" This stunning cover features Spider-Man in a similar scene to the ASM #98 cover as he cant get a grip on the building as the Terrible Tinkerer is working his crazy controls to have the Spider-Mobile kill Spider-Man! This cover is also the VERY FIRST time that John Romita and Gil Kane ever drew the Terrible Tinkerer, as his first and ONLY previous appearance was way back in Amazing Spider-Man #2 in 1963! The logo is a replacement logo which nicely shows ALL of the great drawn artwork underneath in extra red link above. (The Small art 1975 Gil Kane and John Romita Amazing Spider-Man #151 cover sold for OVER $155,000 at auction in 2016, so Don't pass on this stunning detailed ASM COVER, drawn by the 2 greatest Amazing Spider-Man cover artists after Steve Ditko! Compare this nice cover art to the published comic book in the red link above! ALL art on our website (including this one) are able to be purchased with VERY fair time payments, and trades are always considered towards "ANY" art on our website! Just send us an email to mikeburkey@aol.com and we can try to work something out.